"Devon, What Exactly Am I Getting?" 1. YES! 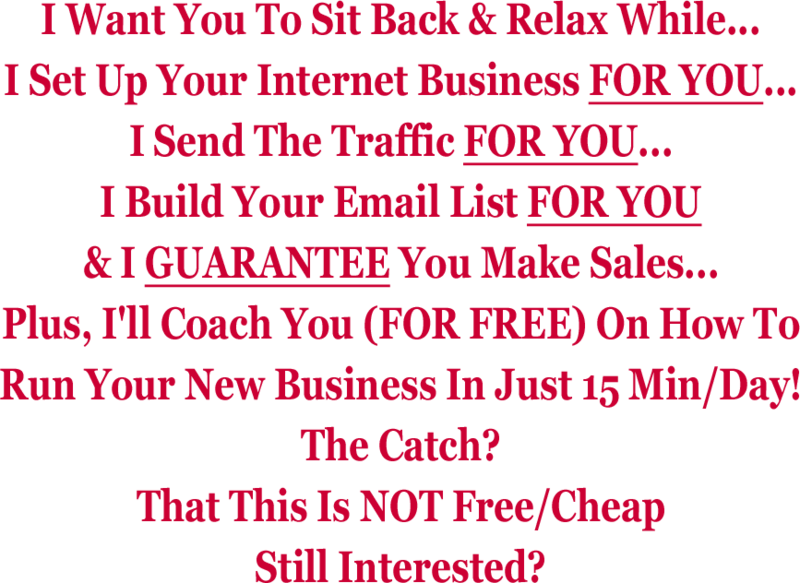 We really are going to set you up with a completely done-for-you internet business. We’ll set up your auto-responder, set up multiple streams of income for you, and make sure EVERYTHING you need to start getting results is up and running in a matter of days. 2. This program is NOT FREE!! You must have money to take part in this! So if you’re broke or you only have a couple hundred bucks…sorry, but this isn’t for you. If you only have a couple hundred bucks (or less) then CLICK HERE to check out our "starter program"
3. This program is NOT FREE!! Yes – I know I just said that. But I’m saying it again. If you don’t have a little bit of money to get started, then please consider joining our "starter program"
The ideal person for this will already understand the value of a list, and understand the value of having multiple streams of income. Maybe you’ve tried to grow a list (or make affiliate sales) in the past but it’s taking you FOREVER. You do NOT have to have any technical experience or anything like that. Like I said, we’re setting everything up FOR YOU! If you’ve failed online in the past, and you’ve had ZERO success with “make money online” systems before, then CONGRATULATIONS, you’ve just discovered the EXACT system you’ve been looking for! Once we’ve gotten everything set up for you, we’ll show you how to manage your system in just 15 minutes a day. 5. YES! This offer is 100% GUARANTEED! Please Set My Business Up FOR ME! Your next step is to submit your accurate contact details below, so a member of my team can reach you with details on how to set up the one-on-one chat where we'll discuss if and how we can work together on your business. Please remember this offer is available on first come first served basis and we're only looking for a handful of serious people to work with. This is NOT a free offer. If you're looking for handouts, you're in the wrong place. If you'd like us to help you drastically shortcut your online commission learning curve by skipping all the technical work and you recognize the value in having someone as experienced as myself do it for you - I look forward to connecting with you real soon on a potentially life changing phone call.